The world of habanos went crazy about Regional Editions “Edićion Regionales” cigars in the past few years, so do the habanos enthusiast. Some of them I literally mediocre and doesn’t worth it, but there are few that really good. These Small Robustos are the 2012 release of Italy which comes in a cabinet of 25, 2000 cabs were made. They were generously gifted my good friend Roberto from Italy. When I first opened the box I was rewarded with a very pleasant sweet chocolate aroma that made me immediately smoke one, however the smoking wasn’t the best. I decided to let them rest in the humidor for longer time and check them again. Just to mention that the date on this box is jun/12. 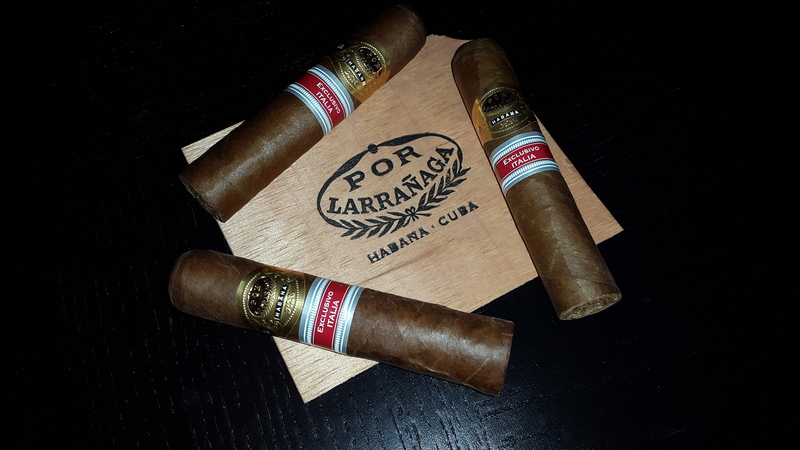 The cigar is very beautiful, with special Por Larrañaga band. The wrapper is darker than usual with a chocolate brown color and fair amount of oils. The prelight draw is just ideal for the size with good about of resistance. The cold draw brings an interesting bouquet of flavors and aromas, cocoa, wood and some earthiness to be mentioned. Well the initial puffs are very good!! Yes just what I like, flavorful with a kick. Pepper, wood and caffe cubano are the main characters comes in a medium body profile. Smoke keep develops to get a mocha like flavor with a caramelized sweetness while the previously mentioned aromas are still there and in a creamy medium body. At the midway point the smoke is very delicious, so chocolaty and sweet, yet there’s still that pepperiness sense on the retro hale and the body still the same. The last part of this cigar gets little warmer than my liking but has strong earthy espresso flavor to end the smoking experience with. I literally like this cigar, from the look and size, to the construction, to the smoking experience. I have to admit that it has changed a lot with age and got way better than the first time I smoked it. I still believe it requires some more time to show what it has. Don’t be fooled my the brand name, since it has way better smoking profile than the normal line. I’m not sure if they are still on the shelves but my advice is if you can fine them get them.